Part Two of the August 1st posts. Onto stitching! On our last Porpoise Bay trip, I put in the last few stitches in the BBD SAL sampler. I was pleased to finish it and proud that I stuck with the eyelets! It took me awhile, but I certainly have become quite the expert with eyelet stitching! Here's the original photo from the campsite. It was a wonderful SAL to be part of. Thank you Barb and Alma for releasing this lovely SAL!! I made some progress on Sarah Chapple. She is such a pleasure to stitch. I just can't believe how large she really is!! I always choose massive projects but I need to keep at them and make progress!! Love the little satin stitched pot under the chained fence! Little pots and birds still to be added! I'm so glad to say that my little stitched box gift I made for the lovely Carol, from Stitching Dreams, arrived and she was happy to receive it. It took me awhile to get it finished since for some reason, none of the stores I visited, had boxes that would fit the design I stitched for her. Thankfully, one dollar store had a box the right size, so I was able to finish it off and mail it to her. We have developed a lovely relationship over the years, like so many of you, and I was happy to make it for her. I hope to make more little gifts for others in the next little while!! I also made a bit of a belated birthday gift for dear Vickie. 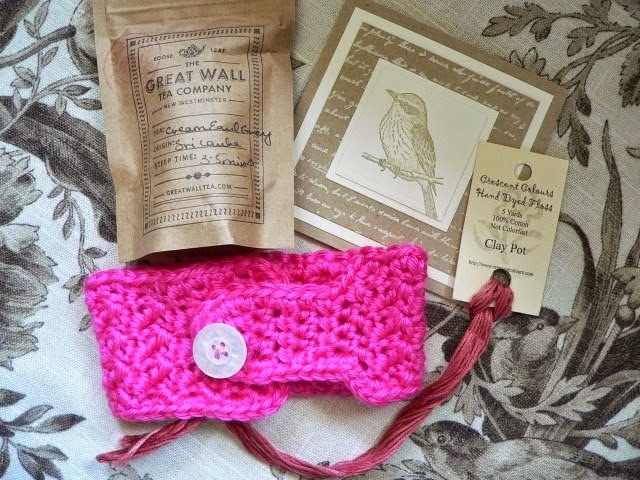 It was a little tea cup cozy, some tea and a pink thread, since she loves pink so much! I had to laugh when she said that her daughter took the tea cozy and put it around little Henry's neck! I never thought of it like a dog collar, but that girl has got something there! Maybe I should make some crocheted dog collars instead of teaching!! Probably would do better than I am now! LOL!! I had to borrow Vickie's photo from her blog since I forgot to upload one of mine. Stupidly, while we were on strike and not making money, I had ordered some stash....seriously stupid me. Why I did this, I don't know. Not sure if we will be working in September so I probably have to start looking for a new job. Really not sure of what the outcome will be. But look at what I got! Even though I can't afford it, it's really pretty. I got a bunch of new cottons to make some new cozies and mats to possibly sell at a craft fair from Loveknitting. Such great service and free shipping over $50 for Canada!! Can't beat that! 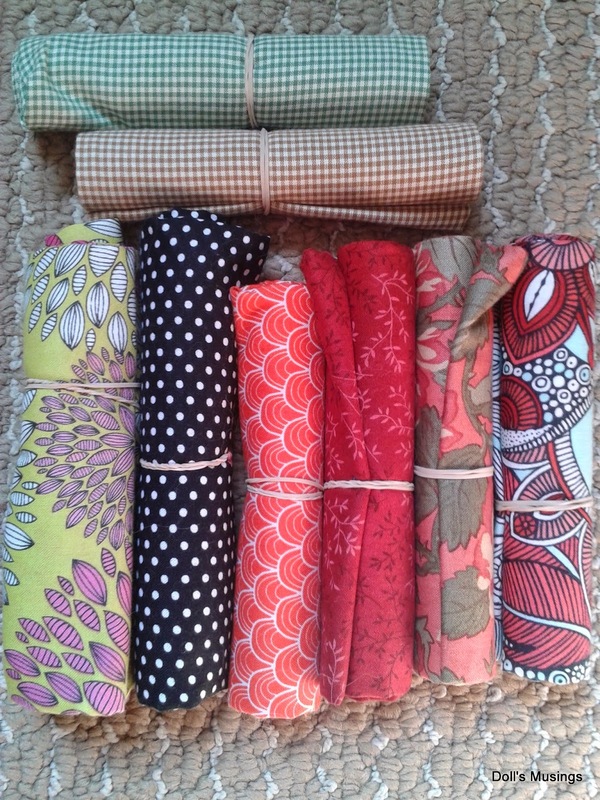 On our Porpoise Bay trip, we went to Carolanne's Quilt shop in Gibsons and I got a few little fat quarters for cheap. Nice for finishing! Then Needlecraft Corner had and anniversary sale..uh oh! 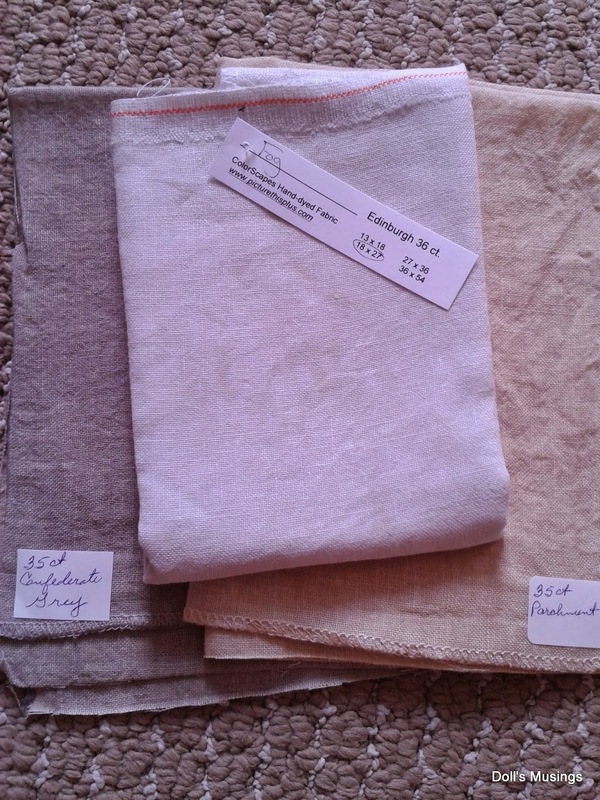 So I ordered a bunch of threads for a sampler, some linens and some mystery NPI silks that I don't know what design they are for. I can't remember why I got them. I had copied and pasted the list from 123stitch so I know it was for a chart...it's a mystery for me. 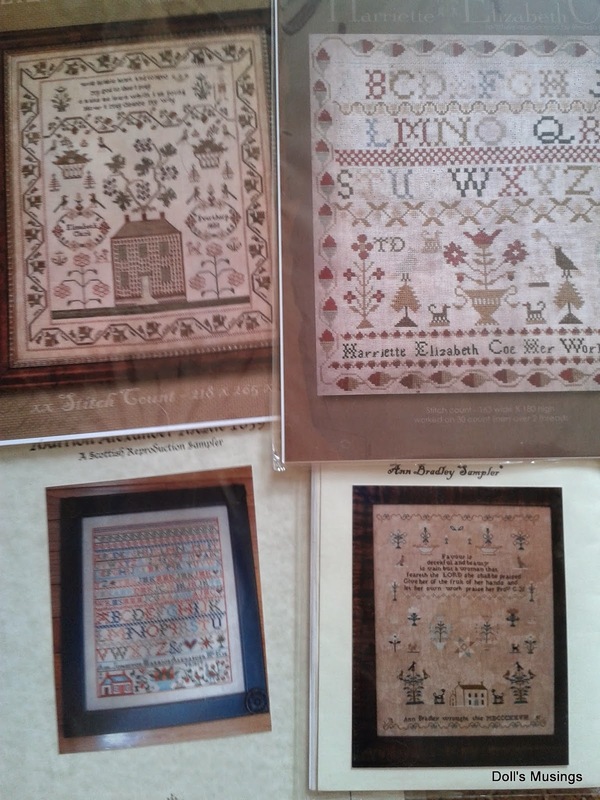 Two of those charts are from Brenda Gervais' With Thy Needle and Thread. I might save these for next year once I'm done Sarah and JCS, but I need to devote more time to stitching every day, not once in awhile!! So I'm done for stash for a LONNNNNGGGG time! I don't need anymore at all, unless it's the odd thread or so, but it's so hard to resist those new charts that come out!! Here's a little photo of my dear stashaholic Titus, owning the threads. He loves it when mom pulls out the stash!! I've haven't caught up with blogs and feel uber guilty about it...so I hope to spend some time tomorrow morning visiting people since I miss you all!! Titus is so cute with the threads! Your eyelets are just lovely and what great stash! Congrats on your sampler finish! Your eyelets are so nice and tidy - very well done and the look is so worth the effort if you can get thru it. 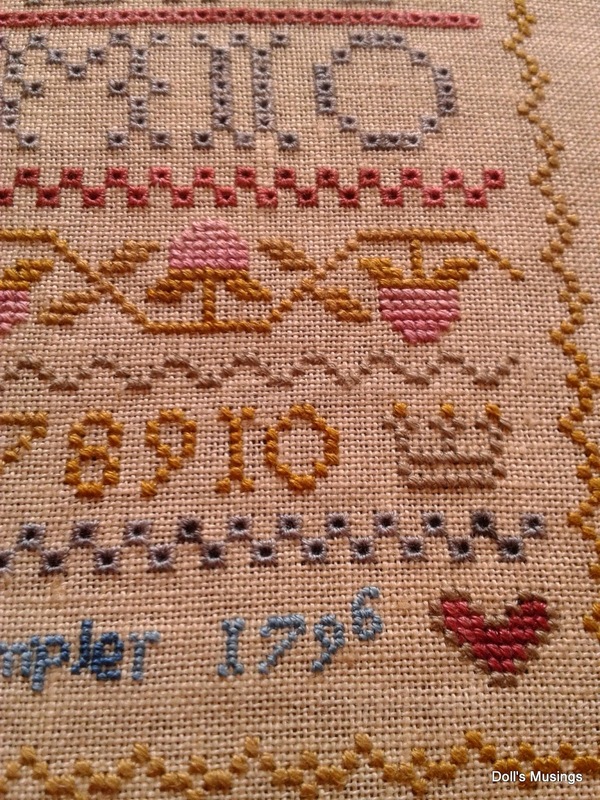 Gorgeous finish on Her Sampler!! Congrats Anne! LOVE all your new stash - wow! 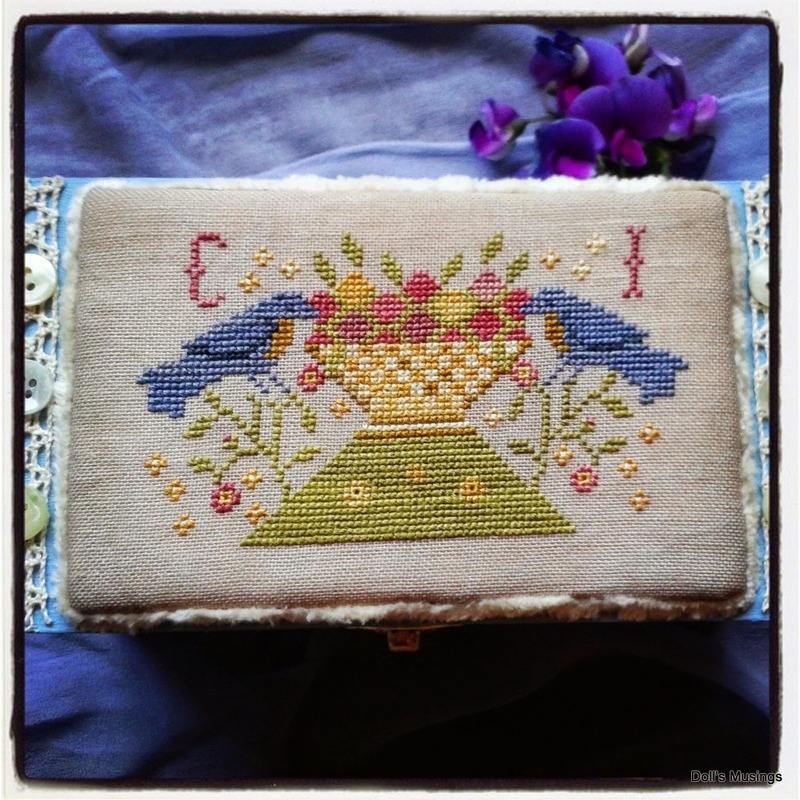 Very Lovely stitched box you made for Carol and darling tea cozy for Vickie! Love the box you made for lovely Carol. I think we all buy to much stash but if it makes us feel good so what enjoy. Love your cat , hugs. 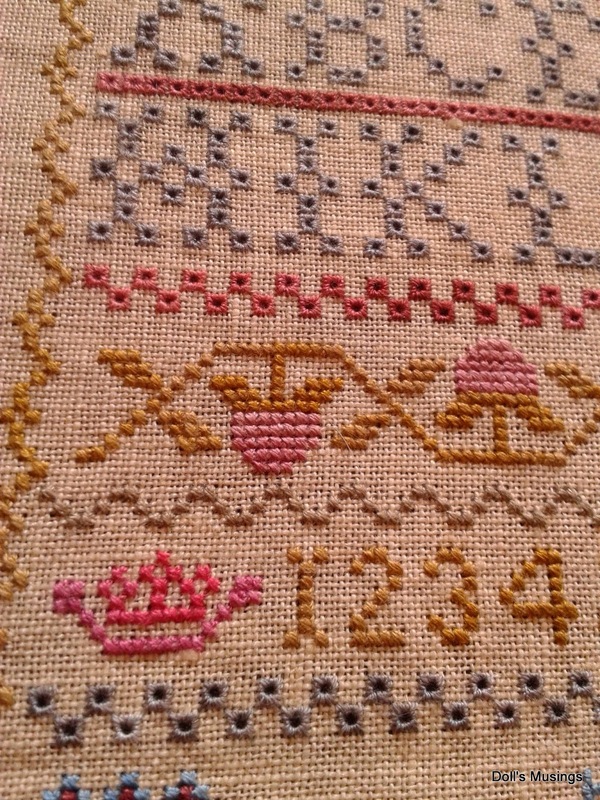 What lovely stitching Anne, I'm loving the Sarah sampler. Your comment about the threads made me smile as it's the sort of thing I do as well. 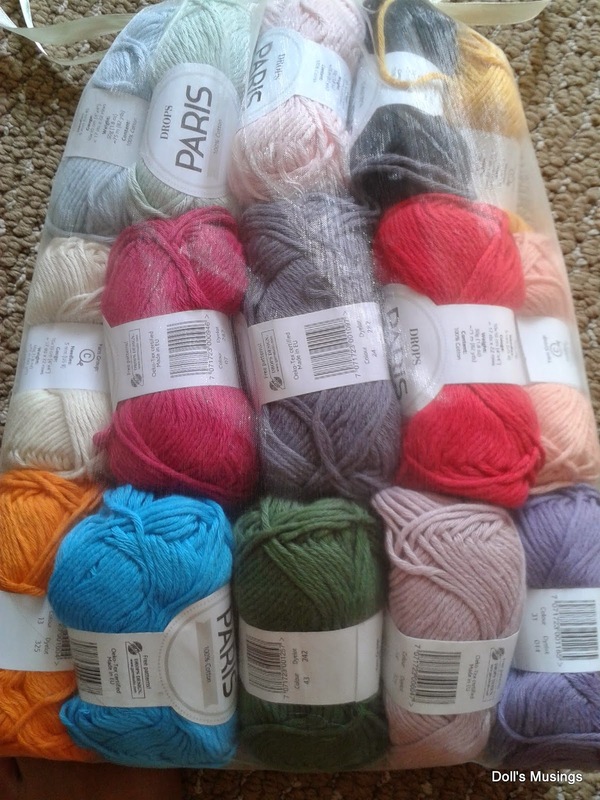 I'm not even stitching at the moment and I'm still buying charts and threads - how crazy is that? Titus looks gorgeous as always - I love to see him in your posts. Oh wow! I do think you should be set up very well with stash for a while there my dear. ha! Your stitching is just lovely. Enjoy all your new stash, looks like Titus is! 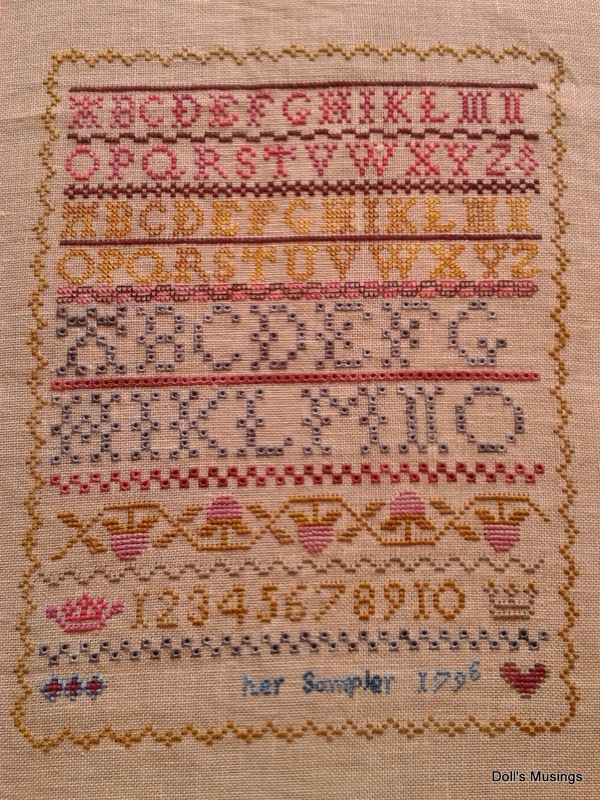 Love your sampler - it's gorgeous. Titus knows how to plant himself, doesn't he? Oh I have Sarah Chappel all kitted up WAITING for me to start her. I got the chart as a bday present from a friend and I too ordered the supplies for it from Needlecraft Corner. I sooooo wanted to order from her sale but I was in the process of moving so I opted to wait for another time. (Wishing now I had went ahead and ordered.) Love your BBD finish as well!! And those cottons.....WOW!! Love them all. Be sure to check out http://www.knitpicks.com/ as they always have free shipping over $50 as well. 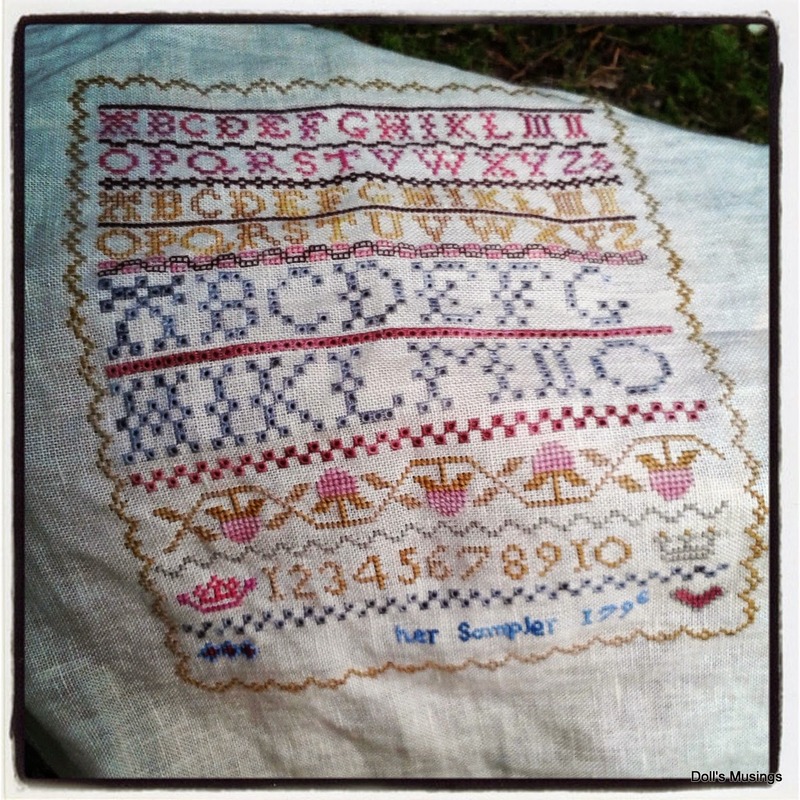 Your sampler is so pretty--I'm sure all those eyelet stitches took quite some time, but they look amazing! Congratulations on a wonderful finish. Hugs to Titus--he's such a sweetie! Beautiful finish Anne and love your WIP. I saw the box you made for Carol on her blog. It is gorgeous. Ooooh that's some lovely new stash there! I really should stop buying new charts although this year I have done very well and didn't buy any, other than the auto I had, until May. 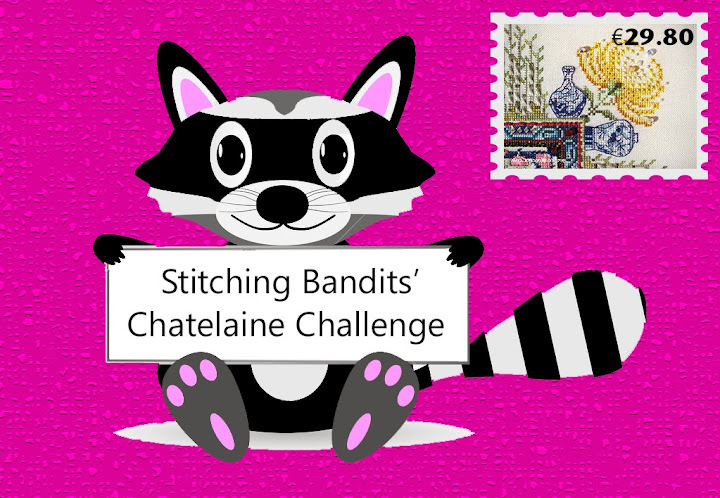 The Stitch fron Stash challenge has been brilliant for me. I forgot to say Titus is so cute! A great post ,I love your finishes and all those threads are gorgeous. I hope your work situation is not too difficult to resolve come September. 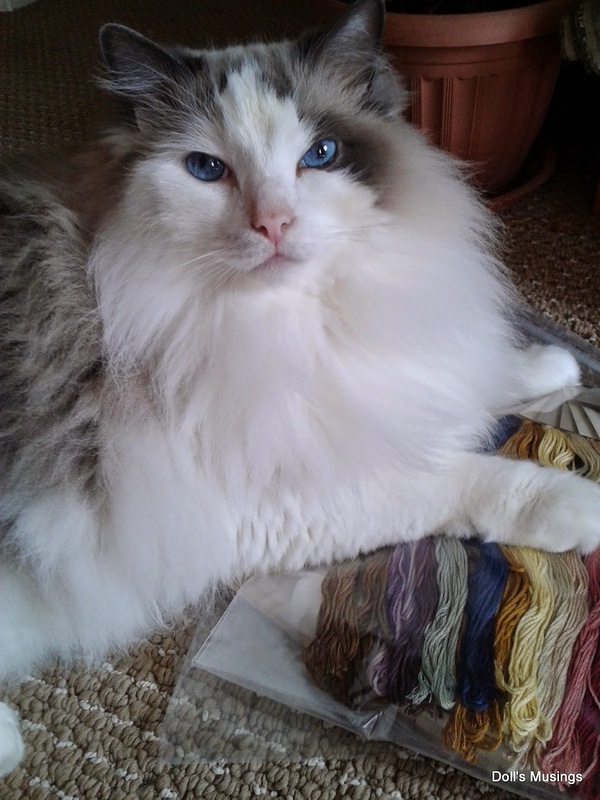 I forgot to mention Titus too.He has the most lovely eyes. Your BBD finish is looking really great. And so is your progress on Sarah. Such a wonderful gift you made for Carol and for Vickie. They must have been so pleased. When it comes to new stash I go with June from Butterfly Wings - if it makes us happy, why not. 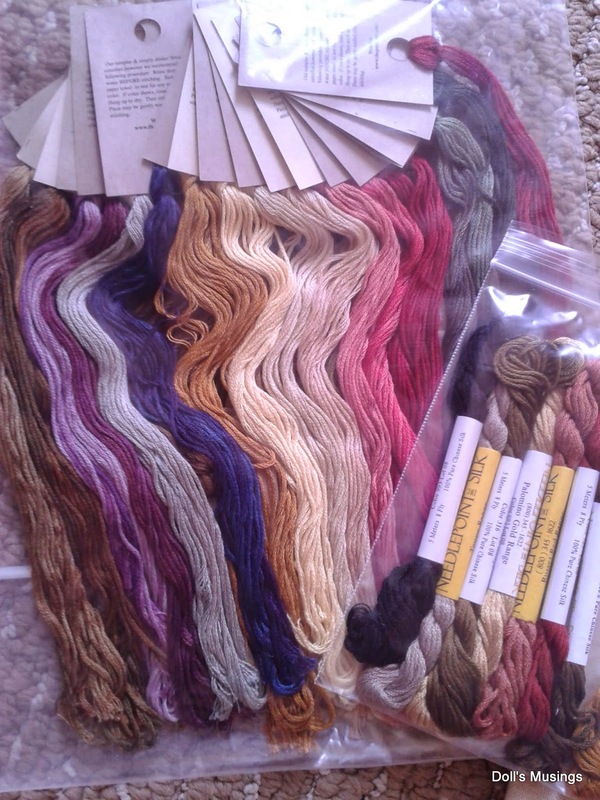 I truely love your new stash, particularly the threads and linens for future projects. And the new sampler charts are a dream. They promise some wonderful stitching adventures in the future. Great finish, well done you for sticking with the eyelets. Lovely progress on Sarah and the box you made is just beautiful. Love all your great new stash. Hope the job situation resolves itself. 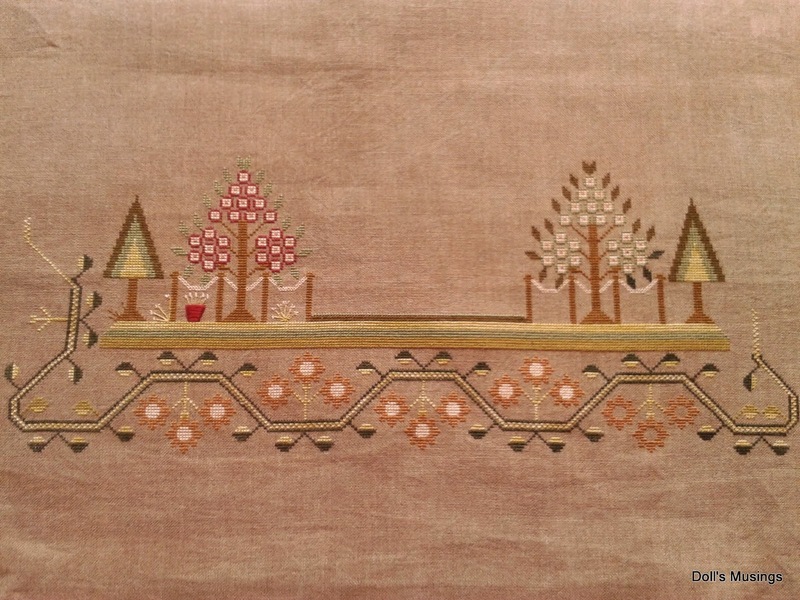 A very lovely post, full of beautiful things. Carols box is stunning, I saw it over on her blog. Nice new goodies and your 'stashkerper' looks like he approves too. Congrats on your BBD sampler finish, Anne. I love your start on Sarah Chapple--it's gorgeous. Your stitched box that you gave as a gift is adorable! Great stash enhancement, too! Beautiful stitching Anne. I love all your new stash. Titus is a cutie. Wonderful finish and lovely new stash :) I know it's really hard to fight sometimes but I've decided that I'm done with feeling guilty over stash!!! We all need a little treat (or two, or three...) now and again and something to keep us going. Look at it as an investment in yourself, in your own stitchy skills and happiness ;) Plus, crafting of any kind is great stress relief LOL! Best of luck with the job situation too! Love your BBD Sampler. Great job on those eyelets. I saw your gifts to Carol and Vickie on their blogs. Very nice treats for the those nice ladies. Fabulous new stash! I'm sure you'll figure out the pattern to go with those silks! Congrats on finishing the BBD SAL piece! You can now be considered an Eyelet Queen--I give you permission! Ha! 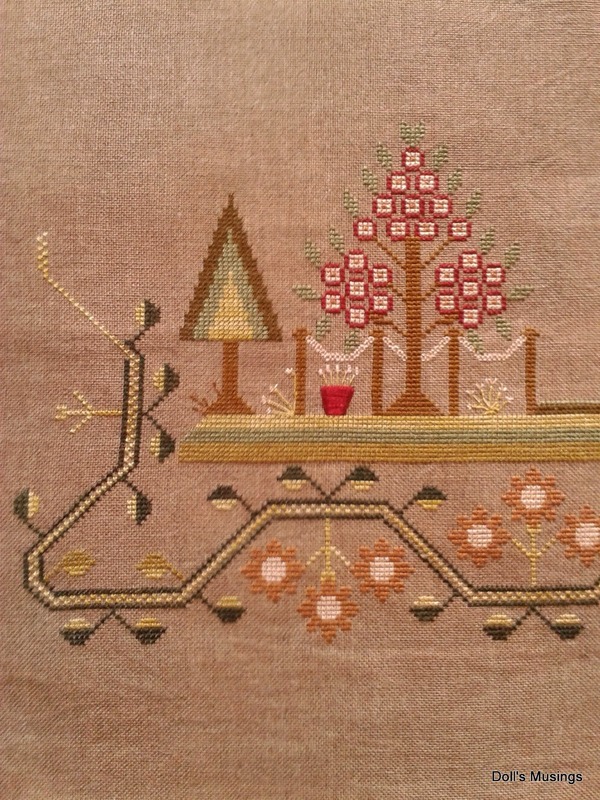 I also picked some really BIG SAL pieces to stitch--whatever got into me?!? I am plugging away on two of three. Feel guilty starting yet another... AND I also found a set of threads kitted for something that I have since moved... they went back into stash since I couldn't locate the chart/fabric! Oh well... Titus is so cute and fluffy! Congrats on your BBD finish, all those eyelets are lovely! Great new stash and I hope that the Teachers get a new deal soon. Titus is so cute, what breed is he again? Lovely finish and a gorgeous gift box. Enjoy your wonderful new stash. Beautiful stitching and finishing. Lovely new stash too. Congratulations on the lovely finishes!! And the lovely stash. =) Maybe you could just Google all the thread colors to find out what the mystery chart is? 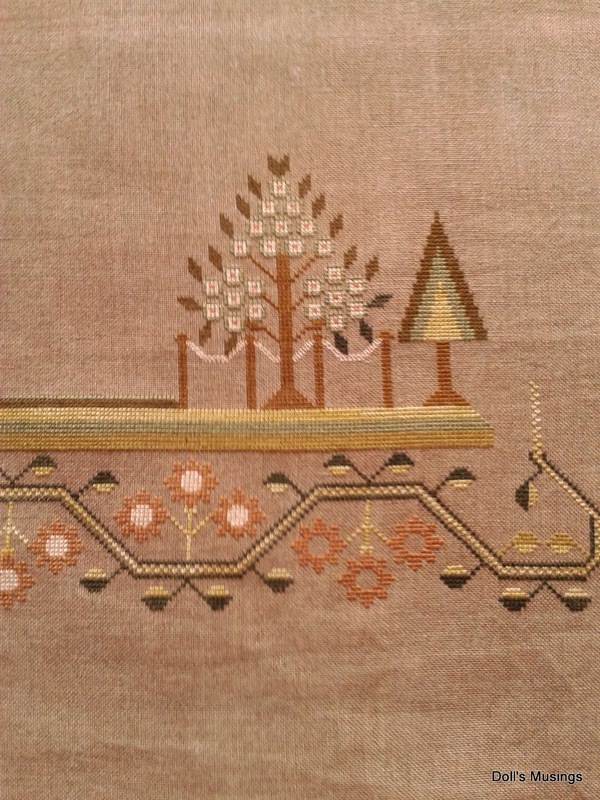 I stitched the BBD design a while back now, it's another lovely one. If you are still not working in September, what happens to the children? Having the odd day off for strikes is one thing but surely it can't go on for long? I really hope they find a solution to the misery. I read a great book on teaching special needs the other day. It was talking about the importance of good staff and said "How do you get and keep good TAs and staff? Simple, pay them more! They are worth it". I couldn't agree more. What a lovely guardian of the stash! Your stitching is lovely and I hope the Union will let you back to work. What a pretty finish on the BBD piece! You did a wonderful job with the gifts for Carol and Vickie. And I'm glad to know I'm not the only one who orders thread and forgets what they were for. :) You sure have acquired some lovely stash of all varieties! Titus is so handsome ~ he looks very possessive of those threads. :) I'm so sorry about your job, Anne. I'm hoping for a good outcome for you. All those eyelets! Yes, I think you can officially call yourself an expert! You really Will be out off a job my September?? Nooooooooo I dont hope so. And hope you Will find a New one soon. It terrible to losse your job. My hubby has it almost every year. We are getting crazy of it. So I know how your feeling. Great job of spoiling yourself now. Now you can craft al those months without looking for New things. Dont feel bad about it. Enjoy it. You Will need it. Beautifull stash WIPs gifts and the finish SAL. Lovely. Carol must been so happy with your gift!! Gorgeous finish and your gift for Carol is fantastic!